Contactless payments – within touching distance or falling further out of reach? Identifying why contactless payments have not taken off dramatically now that card readers and contactless enabled cards are more readily available. The presentation is structured around a general behavioural change model which explores awareness and knowledge, attitudes and barriers. Information has been collected through depth interviews with UK and Japanese consumers, online research using Google ads and desk research, including reviewing chat rooms for consumers and merchants. The webinar will identify barriers to using contactless payments in the UK and make some suggestions to help address these in the future. These suggestions will be directed towards stakeholders such as banks, merchants and payment service providers. 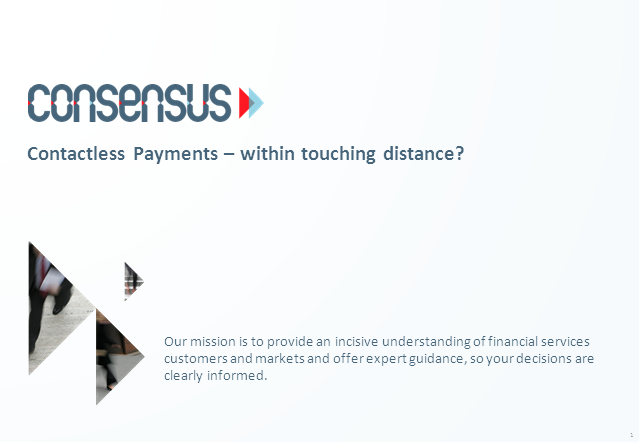 Title: Contactless payments – within touching distance or falling further out of reach?